Tummy time. We all are told it should be encouraged, and some of us try to introduce it into our babies’ life. I was there, I tried with my first. She hated it, she would cry, and I didn’t have the heart to make it last longer than just a few seconds. I still kept trying for a while, and then I gave up. I guess my instincts kept telling me it wasn’t really the best for my child. I never tried with my second. He never had his movements restricted, we didn’t use walkers, exersaucer, electric swing, etc. with him, and you know…he started crawling and walking well before my daughter did. Maybe they are just very different, or maybe there is a correlation. One thing for sure: he is more graceful, he doesn’t fall nearly as much as she did (and still does), and he seems to be more aware of what he is doing with his body. Do I regret not knowing earlier? I DO! And as for those silly flat spots. My daughter had her share of tummy time and she had a flat spot for a long time. My son spent a lot of time on his back, and he never had a flat spot in his life. Makes you wonder, doesn’t it? “When babies are allowed to develop naturally, in their own time and their own way, they learn to move with ease and grace. They tend to have excellent body awareness and posture, and a good sense of where their bodies are in space. 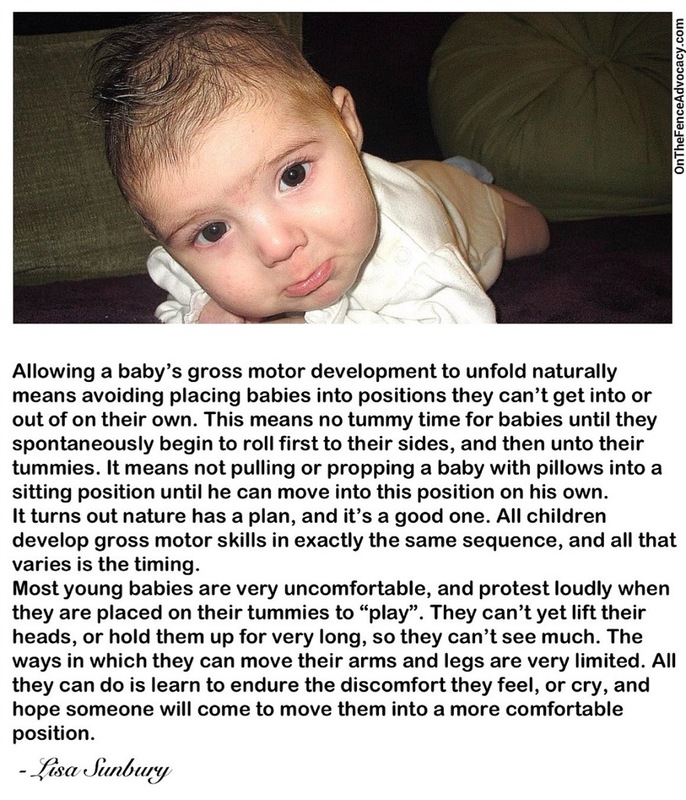 Allowing a baby’s gross motor development to unfold naturally means avoiding placing babies into positions they can’t get into or out of on their own. Ideally, young babies are placed on their back not just for sleep, but for play time as well, because this is the position that most supports their bodies, and in which they are most relaxed, and free to move. This means no tummy time for babies until they spontaneously begin to roll first to their sides, and then unto their tummies. It means not pulling or propping a baby with pillows into a sitting position until he can move into this position on his own. It means avoiding all baby “containers” like bouncy seats, exersaucers, and baby swings, and using car seats judiciously. It means not lifting a toddler onto a piece of play equipment, like a slide, that she can’t yet scale herself.